This is a revised and enlarged version of this book which was first published in February 2002 and which has proved to be a very popular and topical title. Customer Service, or a lack of it, will of course inevitably be a topical subject. 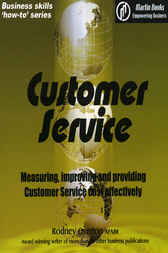 Excellence in the provision of customer service continues to be an elusive target. Many organisations make what often turns out to be hollow promises in regard to customer service, with a subsequently dissatisfied customer vowing to never do business with that provider again. Providing quality Customer Service to customers of your business is a cost effective way of increasing market share and profits. The provision of excellence in Customer Service also offers the opportunity to be seen as a superior, preferred, supplier over your generic, ‘me too’ competitors. At the same time many organisations feel very strongly that their customers have no right to complain about their service levels and endeavour by various means to punish the customer concerned. Many industries appear to have chronic customer service problems. As an example ask consumers about courier deliveries, telecommunications and the IT industry. In recent years the writer has received refunds, in some instances multiple refunds from many of Australia’s best known organisations after taking them to task for poor customer service. Despite many leading edge companies realising the myriad advantages of excellence in Customer Service, and the inherent benefits of taking full advantage of the opportunities provided, many organisations still have great difficulty in providing even a modicum of reasonable service. The successful implementation of Customer Service usually involves a major change in the culture of the organisation, which is very difficult to achieve and involves the investment of considerable time and energy. The queue at a local bank often stretches out the door and into the street. And when you are served, one staff member finds it necessary to chew gum while processing the transaction! This book is especially aimed at those involved in customer service issues, and will also be of immense assistance to most people in business and service organisations. The objective has been to provide easy to read and understand information which can be assimilated into, and used in real life, day to day business situations, quickly, easily, and in many instances, with little expense. We currently have a range of more than 100 books, CD ROMs and Training Facilitators Manuals available, covering areas of business such as Business Administration, Business Planning, Finance, Human Resources, Management, Marketing, Sales and Small Business. A training course based on this publication is available. We welcome your comments and suggestions.